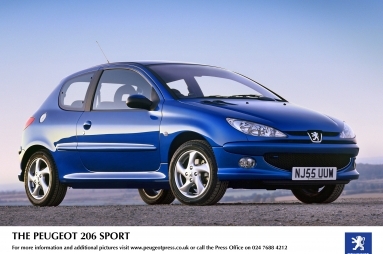 The ever popular Peugeot 206 range has always provided strong visual appeal, with excellent standard specification and good value for money. This has now been strengthened further with the introduction of a new revised, richer 206 model range. Re-named Urban, Verve, Sport and GTi it replaces the Independence, Zest, S and SE models. Prices start from £8195 for the Urban 1.4 rising to £12,345 for the dynamic and stylish, Sport 1.6 HDi 110. Replacing the 1.1 Independence model, the 206 Urban, priced from only £8195, features a more powerful 1.4 litre 75 bhp petrol engine with remote central locking and electric front windows. It is available in both 3 and 5 door models and with two engines, 1.4 litre petrol and 1.4 litre HDi diesel. The 206 Verve replaces the Zest and S models and offers all of the previous comprehensive standard equipment and more. Priced from £9,295 for the 1.4 litre three door model, standard equipment includes air-conditioning, full body colour coding, sports seats, front fog lights, sports bumpers and alloy wheels. It’s sure to be the best selling model as it undercuts the previous "S" model’s price by £345, plus all the extra equipment. It is available in both 3 and 5 door models and with two engines, 1.4 litre (75 bhp) petrol and 1.4 litre HDi diesel. Finally, the new 206 Sport priced from £10,195 to £12,345, replaces the previous SE and Sport models. It is available with two petrol engines, 1.4 litre 16v or 1.6 litre 16v or a 1.6 litre HDi diesel engine, ensuring dynamic performance without excessive running costs. A four speed automatic gearbox is available with the 1.6 litre 16v petrol engine. 15" alloy wheels (except 1.4 petrol 5 Dr model which takes 14" alloy wheels), aluminium interior pack, leather steering wheel, electric mirrors and a new "Sports" interior identify the new 206 Sport. It is available in both 3 and 5 door models. A comprehensive list of factory fitted options enables customers to personalise their vehicles from a full length Panoramic "Cielo" glass roof to a comprehensive Telematics system (satellite navigation / GSM hands-free phone / mono CD – radio) or a JBL hi-fi system for the music connoisseur. The range is topped by two GTi models, the 2.0 litre 180 bhp petrol version or the 1.6 litre HDi 110 bhp diesel version. Both models have six airbags as standard, ESP, 16" or 17" alloy wheels and low profile sports tyres, automatic headlamps / windscreen wipers, leather interior, automatic climate control with digital air-conditioning, sports suspension and a stylish and dynamic interior and exterior. With Euro IV petrol and diesel engines, standard fitment of air-conditioning across the range, improved standard specification and value, the 206 continues to offer customers superb choice with great style.